If towing is necessary, we recommend having your vehicle towed by your Toyota dealer or a commercial towing service, using a lift-type truck or a flat bed truck. Use a safety chain system for all towing, and abide by all state/provincial and local laws. The wheels and axle on the ground must be in good condition. If they are damaged, use a towing dolly or flat bed truck. The following may indicate a problem with your transmission. Contact your Toyota dealer before towing. ● The engine is running, but the vehicle will not move. ● The vehicle makes an abnormal sound. If a tow truck is not available, in an emergency your vehicle may be temporarily towed using a cable or chain secured to the emergency towing hook. This should only attempted on hard, surfaced roads for short distances at low speeds. A driver must be in the vehicle to steer and operate the brakes. The vehicle’s wheels, drive train, axles, steering and brakes must be in good condition. The engine switch must be in the ACC (engine off) or the ON (engine running) position. 4WD models: Put the front-wheel drive control switch in H2. Put the shift lever in N.
●Use extreme caution when towing the vehicle. Avoid sudden starts or erratic driving maneuvers which place excessive stress on the emergency towing hook and the cables or chains. Always be cautious of the surroundings and other vehicles while towing. ●If the engine is not running, the power assist for the brakes and steering will not function, making steering and braking more difficult. ●Before emergency towing, check that the hook is not broken or damaged. 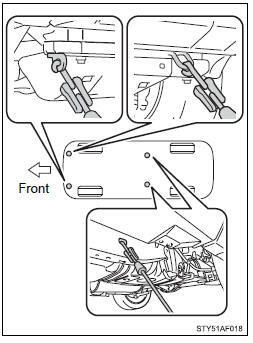 ●Fasten the towing cable or chain securely to the hook. ●Do not jerk the hook. Apply steady and even force. ●To avoid damaging the hook, do not pull from the side or at a vertical angle. Always pull straight ahead. Do not tow with a sling-type truck, either from the front or rear. Vehicles with an automatic transmission: Use a towing dolly under the rear wheels. 2WD models with a manual transmission: We recommend to use a towing dolly under the rear wheels. When not using a towing dolly, release the parking brake and shift the shift lever to N.
4WD models with a manual transmission: We recommend to use a towing dolly under the rear wheels. When not using a towing dolly, release the parking brake, shift the shift lever to N and put the front-wheel drive control switch in H2. Never tow this vehicle wheels on the ground. Turn the engine switch to the ACC position. We recommend to use a towing dolly under the front wheels. When not using a towing dolly, turn the engine switch to the ACC position, shift the shift lever to N and put the front-wheel drive control switch in H2. ●Do not tow the vehicle with the key removed or in the LOCK position. The steering lock mechanism is not strong enough to hold the front wheel straight. 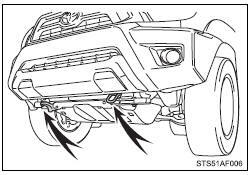 ●When raising the vehicle, ensure adequate ground clearance for towing at the opposite end of the raised vehicle. Without adequate clearance, the vehicle could be damaged while being towed. If your Toyota is transported by a flat bed truck, it should be tied down at the locations shown in the illustration. If you use chains or cables to tie down your vehicle, the angles shaded in black must be 45°. 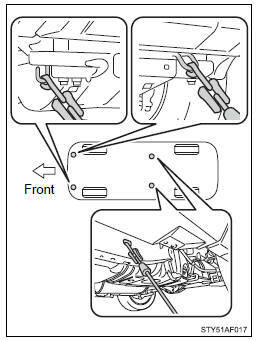 Do not overly tighten the tie downs or the vehicle may be damaged. Apply the parking brake firmly.